This command sets a VTP domain name and enables VTP on a network. If you have full communication between your VTP network, you only need to use this command on the VTP server as other switches will automatically learn the VTP domain from received updates. Note: Switches will not change their domain automatically if they already are in a VTP domain. 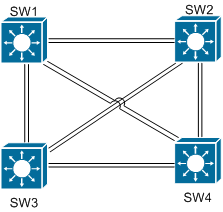 In the below example we will configure SW1 to be in the VTP domain howtonetwork.net. Checking SW4 we can see it automatically joined howtonetwork.net.